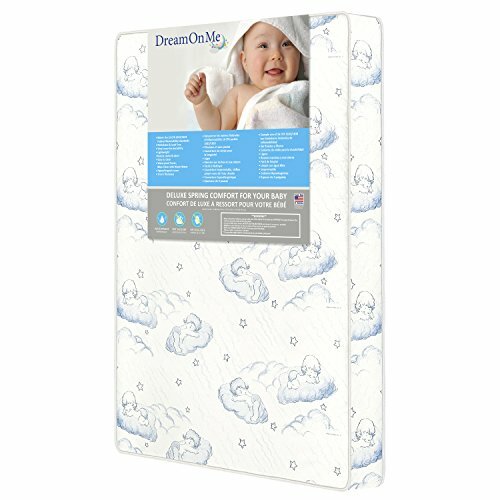 At just the right thickness of 3″, the Two-Sided Inner Spring Play Yard Mattress by Dream on Me is the ideal mattress for the Graco Pack ‘n Play. 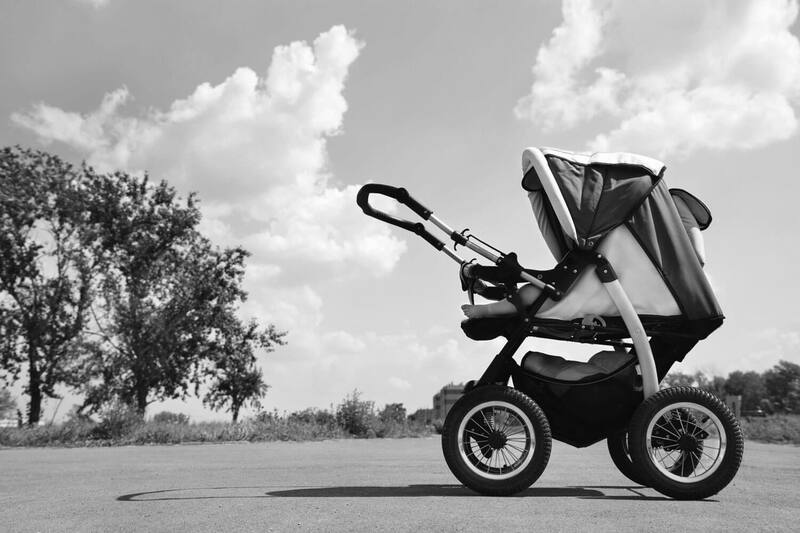 Not only does it offer two different usable sides–one to accommodate an infant and the other for a toddler–it also offers unmatched comfort and durability. 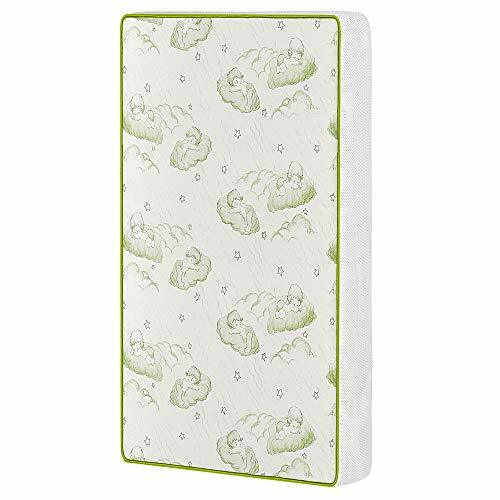 Its’ 10-year warranty on materials couple with substantial value for money make the Dream On Me two-sided mattress the best choice for parents and their little ones. The Graco Pack and Plays are all the rage these days as they can be folded up in a minute, and you are ready to go. This means you can always take your pack and play with you, whether you are going on vacation or on an overnight stay at your in-laws. Some may call them portable cribs. There have been questions about the pack and play’s safety. Are they as safe as normal cribs? Yes, they are, so no need to worry there. Naturally, the most important part of either the crib or, in this case, the pack and play, is the mattress. With so many on offer, how do you decide which one is the right one for your baby? Unfortunately conventional toddler mattresses will not fit the Pack ‘n Play (they’re too long), so you’ll need to make sure the dimensions are the right fit. Companies who make pack and plays don’t recommend putting in an extra mattress because of possible entrapment and suffocation issues. They say that their 1″ sheet is quite enough for a baby to be comfortable. 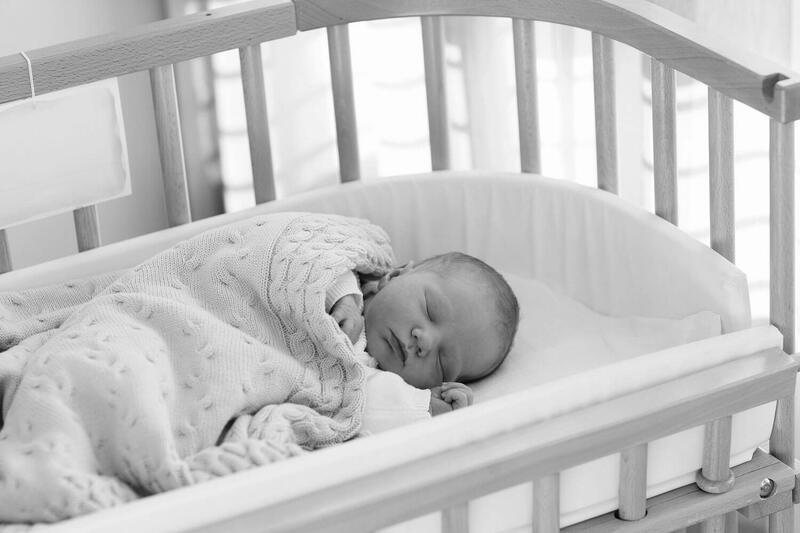 However, a lot of people still like to give their baby that extra bit of comfort which is why we have taken the time to test three different mattresses and share our findings, so you can make your own decision. The Dream On Me 5″ mattress is as safe as they come, albeit a bit thicker than the standard 3″ thickness of most pack and play mattresses. The surface is phthalates-free, lead-free, and non-flammable. Phthalates are normally known as plasticizers and are used to make plastics more flexible and harder to break. As it is a chemical, it is not safe for toddlers. The mattress is spring coil-based (made from interwoven steel coils) so it’s firm and comfortable. It’s reinforced on the edges so it won’t sag. Air pockets inside make this mattress breathable and allow it to stay fresh. As all babies tend to wet the bed, the Dream On Me mattress features antibacterial, hypo-allergenic components (not likely to cause allergies), insulation and water-proofing components. 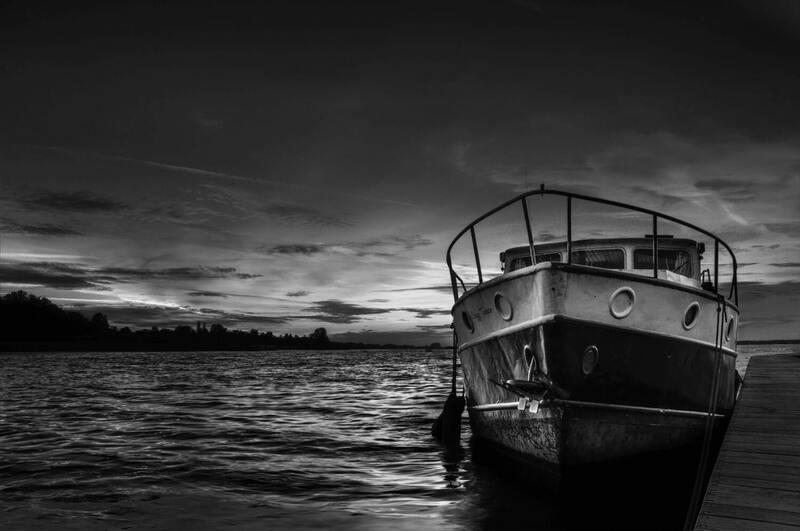 The waterproof vinyl cover is stain and liquid-resistant, while it also protects against mold, mildew or odors. The size of the mattress is 37.5″ by 25.5″ and it fits into most pack and play, playpens or cribs. It’s also relatively light to carry, weighing only 6.5 pounds. This mattress has received plenty of reviews, scoring a rating of 4.5 out of 5 stars from Amazon customers. 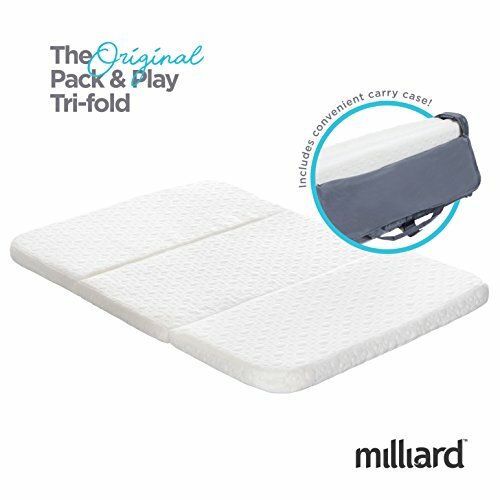 Unlike the Dream On Me mattress, the Milliard pack and play mattress is foam based. The dimensions are 38″ by 26″ with a thickness of 1.5″. For added flexibility, it has round corners so you can fit it into most cribs or pack and plays. It’s designed to fold up and fit into the carry bag you get with the mattress. You can also fit a small blanket in the bag. When you buy it, the mattress will be in a vacuum pack, so when you take it out at home, please allow 24-48 hours for the foam to expand. Of course, because this is a foam mattress, it only weighs 5.2 pounds. It’s worth pointing out at this point that, because of the soft surface, this mattress is not for infants or small babies. This gives it a slight disadvantage compared to other pack and play mattresses. The mattress cover is smooth on the outside but waterproof. A special inverted laminating process prevents any liquids from reaching the foam. At any given point, you can unzip the cover and wash it in a washing machine. Most parents buy one mattress after the birth of their baby and then change it later, once the baby grows into a toddler and can sleep on softer surfaces. What if you didn’t have to buy two mattresses? The difference is that this is a new, two-sided mattress! On one side, the infant’s side, there is a new breath-flow material and on the other, the toddler’s side, the material is waterproof. Even with the two different sides, the mattress is still non-flammable and phthalates and lead-free. Both covers are antibacterial and hypo-allergenic to provide comfort for both the infant and the toddler. The inside construction consists of lightweight, interwoven, heat-tempered coils which provide great comfort for the baby. It fits perfectly into the Graco pack and play! Not only that, but you can easily carry it with you anywhere because it weighs a mere 3 pounds! Some look for style, some look at the price, some at special materials but this is surely a deal-breaker knowing how much „stuff” already comes with a baby. This mattress gets a 4.5 out 5 stars rating in Amazon customer reviews. Most customers have commented on how they used this mattress for much longer than planned, before them finally moving the baby into their own room. After reviewing the sizes and materials, we have realized that we have two different mattresses and a hybrid. All three have similar length and width but they don’t feature the same thickness. On one side there is the Dream On Me mattress with 5 inches and on the other side the 1.5″ foam mattress. In between we may have a compromise. If you need a firm mattress that you can easily maintain, choose the Dream On Me 5″ mattress. 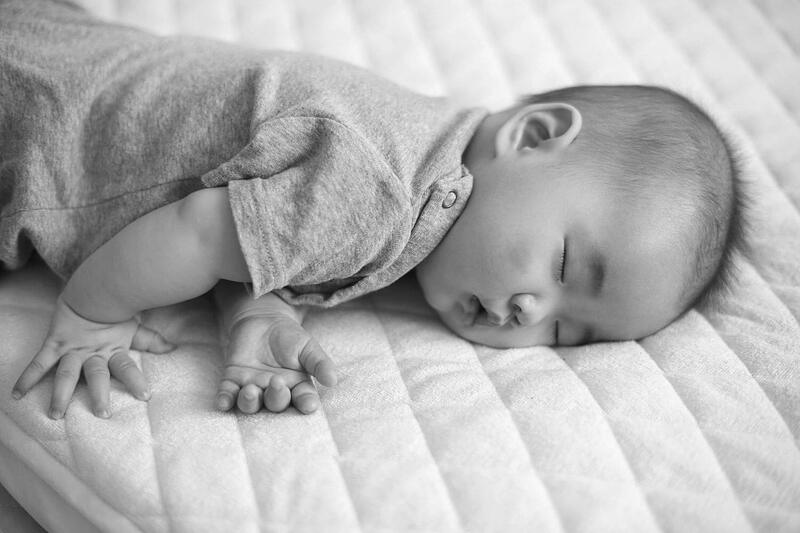 If you have a baby that’s used to sleeping on softer surfaces, go for the comfy Milliard mattress. But if you don’t want to buy two mattresses, maybe the Dream On Me 3″ TWO-SIDED mattress is for you.